SoftPlanet makes it possible for everyone to get free Start Menu X download directly from our servers. There is no registration needed for downloading. Nowadays there are lots of solutions, which claim that can replace the system Start menu in Windows. However there are just a few of them that manage to completely do it. Start Menu X 5.42 is one of them, which comes with full support for Windows 8.1 as well. This software application is completely free of charge and you should definitely try it. This application is probably the best of its kind. 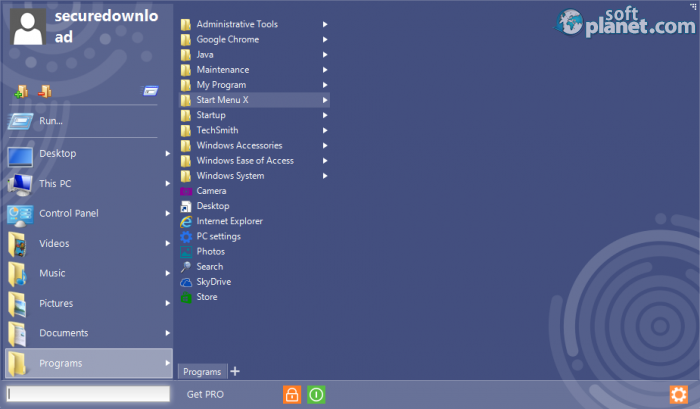 It is true that the main concept of having a substitution of the standard Start menu isn't new, but the user experience that this software offers you is what matters. First it comes with the ability to group programs. Let's say you want to put all graphics editing applications within a single group, all office programs in another one, and so on. If you purchase the Professional version you will get the single-click feature as well as tab support. In addition, this application allows you to set hotkeys in order to perform some of the main actions such as Lock, Switch User, Restart, Shut Down, Sleep, etc. We also love the feature that allows you to skip the Start screen of Windows 8 on start-up. It really irritates most users. Thus you can go around it. The interface of Start Menu X is just awesome. First you are able to choose among several different themes. 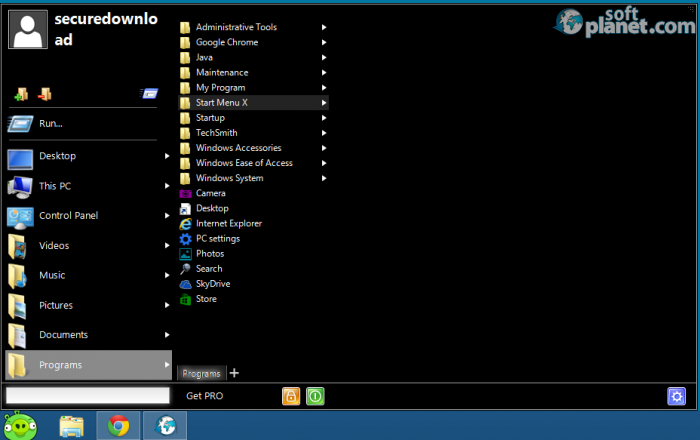 Second, you are able to replace the standard Start menu icon in the bottom left of the screen with a predefined one. For instance, you can put a Bad Piggy. Start Menu X supports the drag-and-drop feature, so you can easily throw programs within a particular group. Besides that this software is fully globalized in 20+ different languages such as Czech, Danish, English, French, German, Greek, Hungarian, Italian, Japanese, Polish, Brazilian Portuguese, Russian, Serbian, Spanish, Ukrainian, etc. In addition, you can adjust the scale and set a fixed width for the columns within the Start Menu X interface. 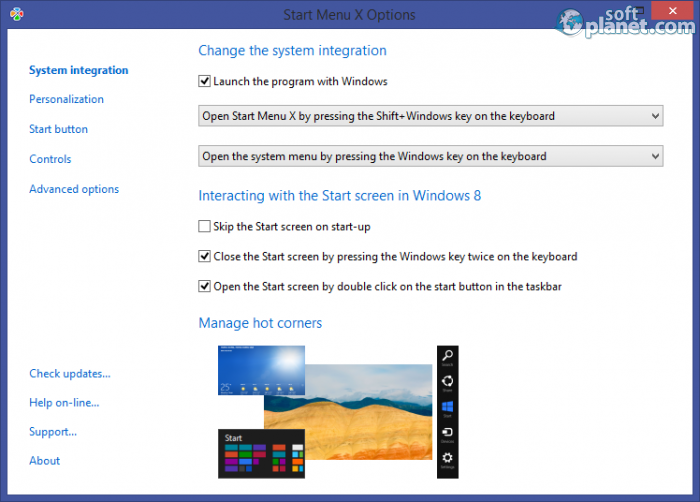 By default Start Menu X launches with the Shift + Windows button combo. However if you purchase the application you will be able to run it with a single click only. Thanks to the drag-and-drop functionality, organizing your workspace turns out to be a piece of cake. We were impressed by quick access to the power panel, which enables you to not only restart, shut down, etc., your PC, but also to schedule when exactly you want this to happen. Cool, right? We are very happy that such software has come to life not only because it enables us to replace the standard Start menu, but also because it allows us to skip the irritating Start screen of Windows 8/8.1, which turns out to be a big failure. Start Menu X is really great software, which will enhance your user experience a lot, thanks to its handy features like Virtual Groups, skin customization, etc. We strongly recommend that you try this application and experience what we experienced while we were testing it. Start Menu X is VIRUS-FREE! 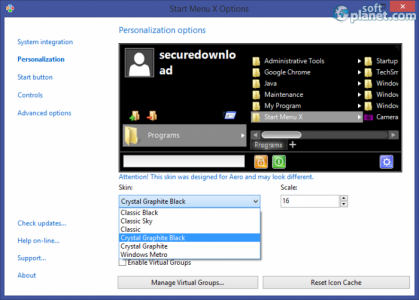 Our security scan shows that Start Menu X is clean from viruses. The current version of Start Menu X has been scanned by our system, which contains 46 different anti-virus algorithms. That ensures that Start Menu X 5.42 is 100% safe for your computer.